What assignment types can I create in a course? Canvas supports five assignment types: Assignments, Discussions, Quizzes, External Tools, and Not Graded. As an instructor, you can select an assignment type when creating an assignment shell. 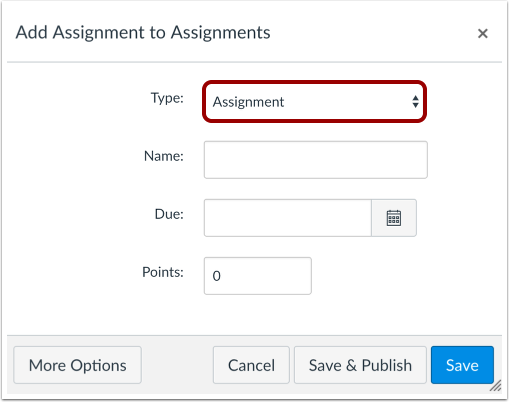 However, you can also create assignments within an assignment type by visiting each type's respective Index Page. An Assignment is a Canvas assignment that can be submitted online through text entry, file uploads, media recordings, Google Docs, URLs, or Canvas pages. 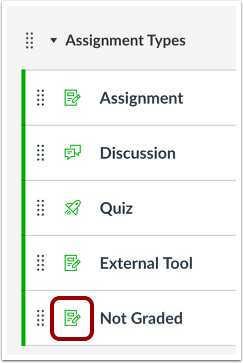 This assignment appears on the Assignments Index Page, the Gradebook (graded only), the Syllabus, and on the User Dashboard (graded only). Assignments can be assigned to individual students, groups, or sections. 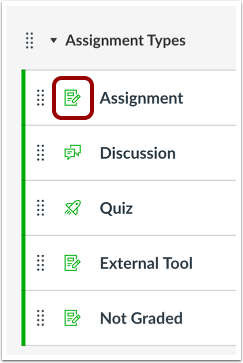 Throughout Canvas, users can recognize assignments with the Assignment icon. A Discussion is a Canvas assignment that will grade student response to discussion topics. This assignment will appear on the Assignment Index Page (graded only), the Discussions Index Page, the Gradebook (graded only), the Syllabus, and on the User Dashboard (graded only). Discussions can be assigned to individual students, groups, or sections. 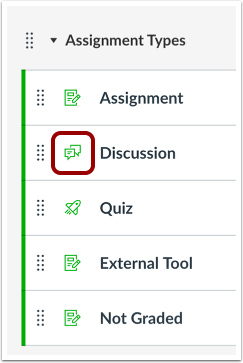 Throughout Canvas, users can recognize discussions with the Discussion icon. A Quiz is a Canvas assignment that can be used to conduct a survey or assess a student's comprehension of course content. 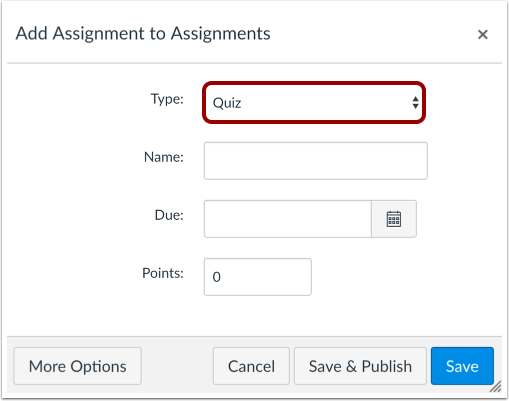 This assignment will appear on the Assignments Index Page (graded only), the Quizzes Index Page, the Gradebook (graded only), the Syllabus, and on the User Dashboard (graded only). Quizzes can be assigned to individual students or sections; they cannot be assigned to groups. 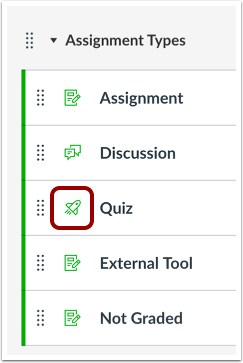 Throughout Canvas, users can recognize quizzes with the Quiz icon. An External Tool is an assignment that utilizes LTI technology to link to a third-party application or website. 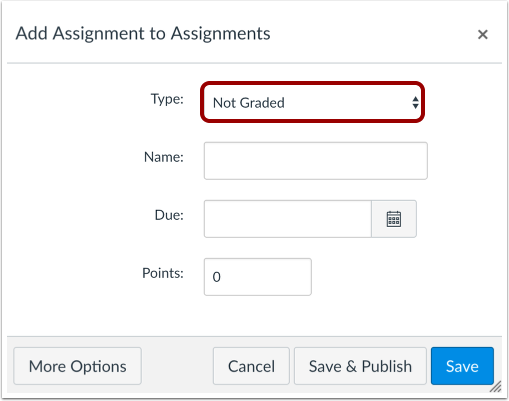 This assignment will appear on the Assignments Index Page, the Gradebook (graded only), the Syllabus page, and on the User Dashboard (graded only). External Tools must be configured in your course before they can be added as an assignment. Learn how to find External Tools to use as assignments. External Tools can be assigned to individual students or sections; they cannot be assigned to groups. 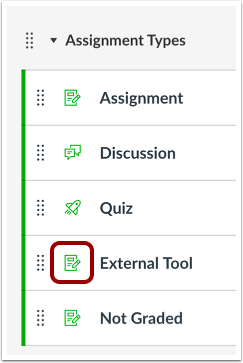 External Tool assignments are identified as assignments, which users can recognize with the Assignment icon. Not Graded is a Canvas assignment with a due date, but no points or grades will be given for completing the assignment. This assignment type can be used for practice assignments as well. This assignment will appear on the Assignments Index Page, the Syllabus, and the User Dashboard. Not Graded assignments can be assigned to individual students or sections; they cannot be assigned to groups. Not Graded assignments are also identified as assignments. Previous Topic:What is the difference between a Canvas Assignment and a Canvas Activity? Next Topic:What is the difference between assignment due dates and availability dates? Table of Contents > Assignments > What assignment types can I create in a course? Re: How do I set up the gradebook?